It’s the birth date of Dorothy Canfield Fisher (1879-1958), Understood Betsy, Virginia Sorensen (1912-1991), Miracles on Maple Hill, and Chaim Potok (1929-2002), The Chosen. February has been designated Plant the Seeds of Greatness Month. Of course, any time we connect children with a good book, seeds are being planted. But certainly children of the twenty-first century will need both math and science skills for the duration of their lives, and exciting books in this area are far too hard to come by. 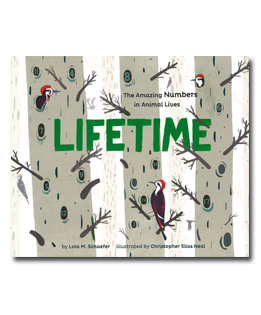 But in 2013, Lola M. Schaefer and Christopher Silas Neal published Lifetime: The Amazing Numbers in Animal Lives. In this book the author uses a very complex idea—how many times an animal performs one particular act or develops one feature in its lifetime—to make numbers and natural science comprehensible for young children. Not only unique, but also enjoyable, the book begins with the statement that a spider will spin one papery egg sac, and moves through various numbers until one male seahorse gives birth to a thousand babies. Along the way, readers learn about fascinating creatures and the numbers of things they create. The pileated woodpecker rattling away on trees will create thirty nests; a snake will add forty beads to its rattle. A giraffes showcases two hundred spots on its body. In six pages of highly detailed notes at the end of the book, information about the animals featured, a discussion of averages, and a page on math round out the book. The author has provided two problems to solve for those so motivated, along with the answers. 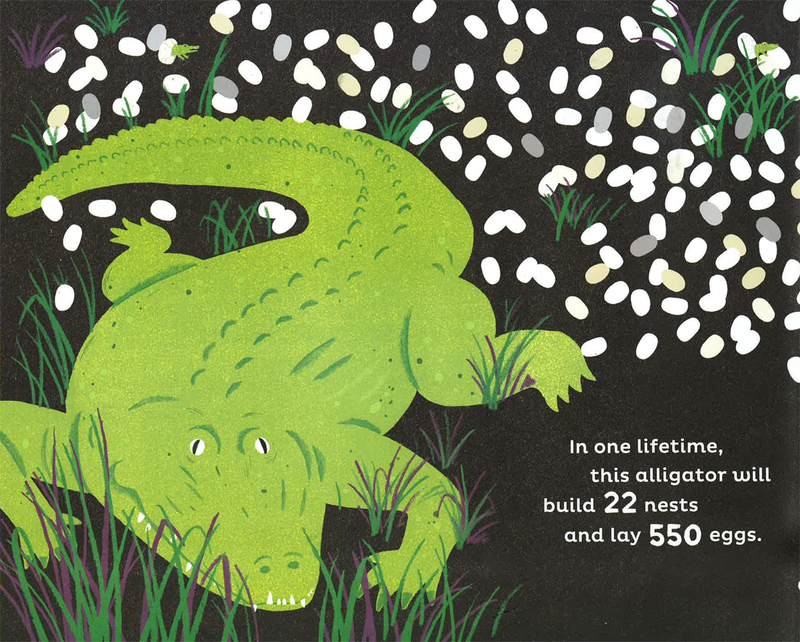 And, of course, the book naturally lends itself to encouraging children to pick a favorite animal and come up with the math averages for that animal’s life. Christopher Neal brings the text to life, providing views of elegant animals in mixed media. Even if a young reader simply wants to look at the pictures, and count the objects, they will absorb many important concepts. I have always believed that learning can, and should, be fun. Obviously Lola Schaefer and Christopher Neal agree with this approach. The resulting book can be read to pre-K and kindergarten students and used in more detail with elementary school students. I myself am working on a counting book about my dog Lancelot. On average how many times today will he beg for a walk—or to be let out in the yard? How many times in a day does he bark at the neighbor’s dog that he loathes? I’ll keep you posted. I’m just grateful that we keep seeing original, exciting, and satisfying works of nonfiction for children like Lifetime. Originally posted February 17, 2014. Updated for . A perfect match of author and concept. Thanks for sharing this, Anita. I love this idea! My 5-year-old is into animals, and he is always asking a lot of specific questions – especially “how many?” I think this will be right up his alley – and love how it incorporates math and science. I’m also glad to know it is Dorothy Canfield Fisher’s birth date – I have not one, but two, well-worn copies of Understood Betsy from my childhood. I wore one copy out so much that I got another, and did the same with that one – and have held on to both! Thanks for sharing! Thank you so much for your kind words, Anita. LIFETIME was such an amazing book to write. I learned very quickly that when you need information that no one knows, there’s work for everyone. Thankfully, the experts I contacted were more than willing to help me find and compute the numbers in this book. And, of course, Chris’s art is the crowning jewel of the entire project.